Ice-cream maker Simon Edye has been selling his wares since 1983. 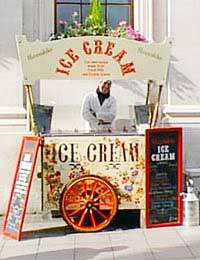 He launched his business, Ronaldo, from an ice cream barrow and now also sells through shops and at festivals and events. Here he discusses making sugar free ice cream. Q: What unusual flavours do you make? A: "I will make any combination of flavours into ice cream as long as I think it will please! I follow my own recipes and use local fruit, milk and cream." Q: Do you ever make sugar free ice-cream? A: "I do not have a problem with sugar, though unrefined sugar is much more interesting and flavoursome. Simple carbohydrates are quite like sugar and quite relevant to our survival. Too much sugar, like too much of anything will end in sorrow, not to mention rotting teeth, diabetes, death etc. But ice cream is sweet !" Q: What do you use to sweeten your sugar free ice cream? A: "I have made it with honey, agave syrup, date syrup and maple syrup (strong taste!). I have also used concentrated apple juice." Q: How well do these recipes work? A: "In order to for an ice cream recipe to work, at least 33 per cent (or even better, 35 to 36 per cent) must be solid ingredients - and the remainder water. Bear in mind that a 12 per cent cream will be 84 per cent water, traditionally the difference being made up with sugar 10 to 15 per cent and additional milk solids (particularly milk proteins). "To replace the sugar (98 per cent solids) with honey (80 per cent solids), agave syrup ( about 60 per cent solids), date syrup (75 per cent solids), maple syrup (45 per cent solids) or clear concentrated apple juice (70 per cent solids) you will need to add more solids, the easiest being to use a thicker cream. In my opinion, these replacements are fun and may suit certain recipes well, but the secret of good eating is variety, nothing to excess." Q: What do you think about using artificial sweeteners? Q: Can you give us some recipes that could be made at home? A: "Yes, these are all very rich, suitable for small portions at the dinner table, but not for wholesale indulgence! You will need an ice cream machine to make them. "I have not suggested using egg yolk in any of them as I do not like the taste and the egg should really be heated or pasteurised. In an ice cream machine, whip up the ingredients in the order shown and then put in the freezer in a stainless steel bowl, remove periodically during the freezing process, and whip again. The addition of up to five per cent brandy (or a similar strength spirit) will make the ice cream 'soft scoop' and possible to spoon out straight from the freezer (use vodka or calvados with the apple flavour)." An ice cream with a strong flavour. Use broken walnuts if you prefer. "Mix the maple syrup and cream. Put it into your ice cream maker, add walnuts." A flavoursome fruity ice cream. Bramley apples work well. "Put your cream in the ice cream machine and switch on mixer, gradually add the cold apple puree, then add the clear concentrated apple juice." "Use date syrup in this recipe instead of sugar. The mashed banana also helps to sweeten." "Put your cream in ice cream machine and switch on mixer, gradually add the date syrup, mashed banana and lastly the orange juice and zest."